Claudio Hummes, holding the microphone, inciting steelworkers to strike against their bosses in the early 1980's. At that time, he was Bishop of St. Andre, Brazil. Bishops of St. Andre, St. Bernard, and St. Caetan. These three cities surrounding Sao Paulo have the greatest concentration of workers in Brazil. From this movement inspired by ecclesiastical authorities, the Brazilian worker party was born. 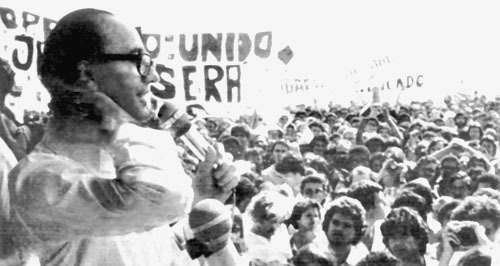 Later, Communist president Lula came to power as a representative of this party. Then, the Cardinal of Sao Paulo was Paulo Arns, who gave full support to this worker movement. Today the Cardinal of Sao Paulo is Claudio Hummes, who is considered the heir of Arns and continues the same work.